Fife Flyers fans faced a panic this morning when it was announced that top scorer Paul Crowder had signed for another team. However, his move to Sydney IceDogs of the Australian Ice Hockey League will not take place until after the end of the Elite League campaign. 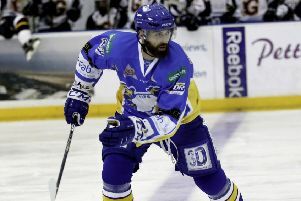 Joining the 33-year-old in his move Down Under will be his younger brother, Tim Crowder, who also currently ices in the EIHL with Coventry Blaze. Announcing news of the signings, Ice Dogs coach Andrew Petrie said: “I’m excited to work with Tim and Paul. The siblings are both leading their current teams in scoring, Tim with 19 goals and 31 assists for Coventry, while Paul has managed 22 goals and 29 assists with Fife. The Canadian duo will complete the move to Australia on April 20, a week after the EIHL play-off finals weekend in Nottingham.